A decent amount of action and a whole ton of background stories finally happens in this arc of the series! We find out what’s become of Shu, as well as what his plan to save Inori and his friends is. But more importantly, we finally get the whole background of the story that’s beginning to unfold, which makes these two episodes all the more interesting. With Inori kidnapped by Gai and sentenced to let Mana take over her body to start the second Lost Christmas, all hope appears to be lost. However, while Keido is busy overseeing Daath’s progress, Haruka has a plan of her own. She steals away into the chamber of GHQ that Mana was supposed to be contained in (I say ‘supposed to’ for a reason) in order to kill her and end everything once and for all. As expected, Mana is no longer in her containment room which Haruka finds out about from Keido, who just so happened to be hanging out in said containment room. Haruka demands to know what he’s up to, but when he laughs and doesn’t tell her his master plan to dominate the world, she begins to plead with her older brother. Wait, what? Apparently Keido – evil mastermind who wants to destroy the world – is Haruka’s older brother! I for one actually didn’t see that twist coming. Anywho, when Haruka refuses to back down, Keido shoots her and we cut to a scene of Arisa dealing with the aftermath of her grandfather’s death. According to the report Daath is now sending out to their subordinates, Haruka was able to get away from Keido without dying and even managed to steal something of great importance. 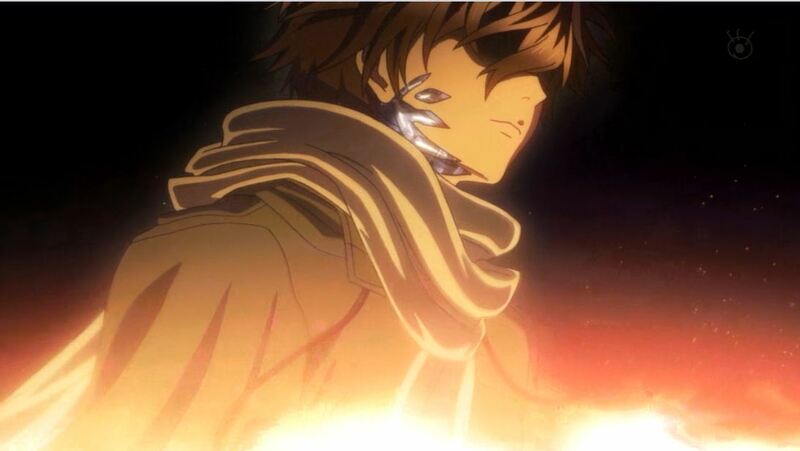 Daath is now sending out orders to capture Haruka dead or alive and bring her to Keido and/or Gai. 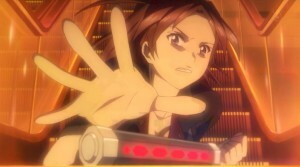 As she’s looking through the report, she’s surprised when Shu appears behind her and pulls a gun on her. The two chat quietly and Arisa agrees to take Shu to GHQ to help Haruka out, so long as he promises to let her speak with Haruka once they find her. The two take off, Arisa saying that she is going to search for Haruka in order to bring her back to Gai and she’s able to take off without much commotion. Meanwhile, Haruka managed to escape on a motorcycle (and looked quite badass if I say so myself) and also found her way to Arisa’s grandfather’s mansion. She’s relieved when she runs into an old comrade, but is shocked to find that Arisa’s grandfather has passed away. Haruka is ushered inside to catch up on what is going on while they plot their next move. Meanwhile, Makoto was put in charge of a large scale search for Haruka and managed to capture a member of the Undertakers. He tortures her until she gives him the information he wants, then he kills her. He then organizes an attack on the estate that the remaining Undertakers are hiding out in by utilizing people looking for medical supplies to tug at their heartstrings. Unfortunately, the plan seems to work; at first the civilians are just asking for assistance, but with a few words Makoto is able to turn them into an angry mob, trying to break down the door. Oogumo, deciding to show them that they don’t actually have any supplies, opens the door to show them such. Makoto then takes the opportunity to use his Anti-Bodies squad and attack everyone. Oogumo shields Haruka and her comrade so that they can get away, but ends up dying due to the assault. After escaping the attack, Haruka, Argo and a few others rejoin the remaining Undertakers, though everyone is saddened by Oogumo’s death. The case Haruka stole is eventually revealed to contain the last Void genome available and she talks to Ayase about it and how Shu isn’t her real son, but she loves him like a mother would love her own son anyway. Of course, Makoto finds them and launches another attack on their hideout and as everyone is scrambling to escape, Arisa and Shu happen to be driving past where the building is. Before Arisa can do anything, Shu jumps out of the moving vehicle and high-tails it to the building to save his friends and family. Makoto corners much of the group just as Ayase agrees to take the injection of the Void genome and shoots at Haruka, causing her to duck and drop the vial. Makoto then goes on one of his monologues, giving Ayase time to turn her wheelchair towards the staircase the genome fell down and slide down the banister all while Makoto is shooting at her. Just as she’s about to grab it, Makoto kicks it out of her reach, but doesn’t seem to notice Shu standing right there. Despite everyone’s protests, he injects himself with the genome (something Haruka didn’t want to happen because there’s a high risk of Shu dying if he were to have the genome injected twice) and somehow survives. In fact, his right hand regrows, but it’s made out of the same crystal that the cancer patients sport. Shu withdraws his own Void, which basically allows him to take on the weight of other people’s Voids and their burdens, and defeats Makoto and his forces, saving everyone. At the end of the fight, we notice that he now has the cancer crystals growing on his cheek, but Souta doesn’t seem to have any symptoms of the cancer anymore. In this episode, we finally get a good amount of back-story on several of the more mysterious characters, including Keido. It’s about damn time too, if you ask me. The episode starts off with Keido and Gai; Keido informs Gai that Shu has managed to get the Void genome again and was able to draw out his own Void. Gai says that he already knew that, which shocks Keido, but instead of paying the older man any more attention, Gai turns his attention to Inori. Or should I say Mana. It appears that she’s starting to win against Inori in the fight for control of Inori’s body. Mana reassures Gai that soon she’ll have control of the body and that she can’t wait to have lots of fun with him. Meanwhile, Yahiro and several other students are on a ship in the middle of the ocean – the only place they can really have refuge from GHQ – and Yahiro contemplates what he should say to Shu about the previous day. Before he can really think about it, everyone is summoned to one of the rooms inside the ship because there’s a transmission being broadcast from Ward 24. The message turns out to be Gai (who else?) informing the world that because of their numerous attempts at hacking into their systems and threats of nuclear warfare and whatnot, he plans on ending the world on December 25th. Once the transmission ends, it’s revealed the Gai is attempting to unleash the Lost Christmas on a global scale and let survival of the fittest determine who lives and who dies. At this point, Gai’s former second in command of the Undertakers enters the room. He somehow was able to get out of prison and brought them a gift; the diary of Shu’s biological father. Now here is where we finally learn what really happened to cause all of this. 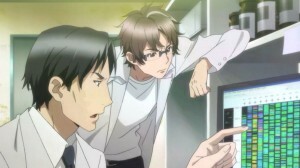 As it turns out, Shu’s father was a scientist who was working on unraveling the code of evolution and Genomic Resonance. Keido was a graduate student at the time and the two became fast friends/rivals. Both used the other to better their research and push themselves harder. Of course, Shu’s father ended up falling for a young medical student and the two were quickly wed and Shu’s father took his new family to live on Oshima while he continued his research in the city. A few years later, Mana and her mother discover the meteorite that starts the whole virus calamity and Kurosu does some research on the cells of the meteorite. As it turns out, the stone carries cells that react to Genetic Resonance in humans and gives them the power to become the next step of the evolution chain. 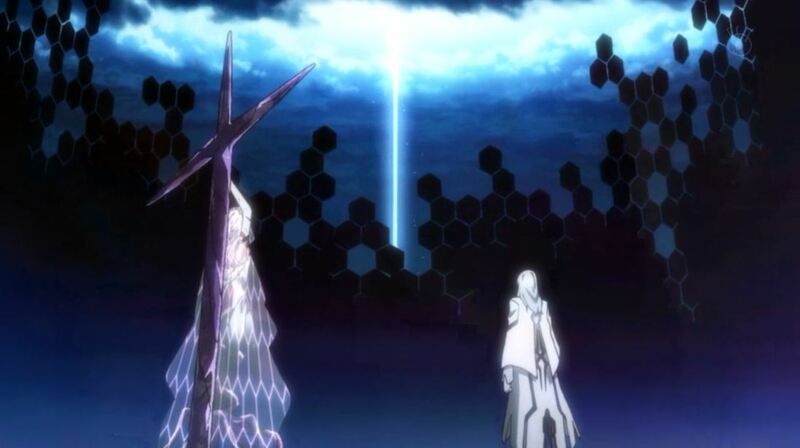 This realization ends up getting the attention of Daath and their representative Yuu offers to work with them since they have been waiting for the tools to create the next apocalypse and it appears that this virus is just the thing. Meanwhile, Mana is slowly becoming Eve while her mother – who is also pregnant with Shu – begins dying because of the cancer. Yuu informs Kurosu that he can’t terminate his wife’s pregnancy because Mana seems set on her unborn brother to become her Adam. 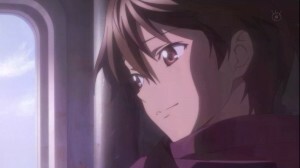 Eventually, Shu is born and his biological mother passes away, leaving him in the care of Mana and his father. Haruka then enters the scene and the two of them eventually fall in love and marry, though Keido is furious about it because he’s now competing with Kurosu in terms of decoding the mysteries of Genetic Resonance. All while this is going on, we find out that Gai was a victim of child trafficking and was selected to be injected with strengthened strains of the Virus in order to find someone suitable to become the Adam for Eve. 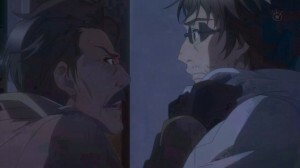 In an attempt to escape his fate, Gai breaks out of the facility and is eventually found by Mana anyway. Some time passes and as the events we already know about unfold at the church on Christmas Eve, Haruka goes in search of Kurosu, who was supposed to meet them at the church for their first real family outing. Unfortunately, Keido finds Kurosu first and driven mad by the fact that Kurosu was able to single-handedly unravel the mystery of the genetic resonance as well as a cure for the virus, Keido kills his brother in law and steals the journal which depicts all of Kurosu’s research. 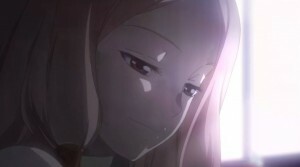 Back in the presence, Haruka reveals that Mana was able to take over Inori’s body during the second outbreak of the virus and is becoming stronger every day because the Voids that Shu has been drawing out are actually part of her soul that was shattered and scattered throughout the city during the initial Lost Christmas. Determined to stop Mana and Gai, Shu agrees to participate with a final attack from Undertakers, but first tries to give back the other’s Voids. This is because if he dies, they’ll die with him, but everyone refuses his offer. 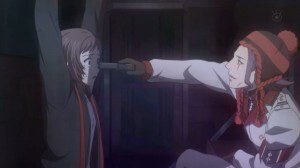 Souta and Shu finally forgive each other and the two part on good terms for the first time in a long time. Opinions: The back-story of Shu’s parents and how everything came to be was interesting in itself. I had never expected Kurosu and Keido to be friends at some point in the past, let alone for Haruka and Keido to be brother and sister. However, I suspected that Haruka wasn’t Shu’s biological mother since she almost seemed…too distant. Learning everything that happened before the series started definitely helped to fill in some gaps, but it still leaves some questions as to why Mana was chosen to begin with. With only two episodes left in the series, it’ll be interesting to see how everything is wrapped up, but I hope it’s not quite as rushed as the conclusion of the first arc of this series.